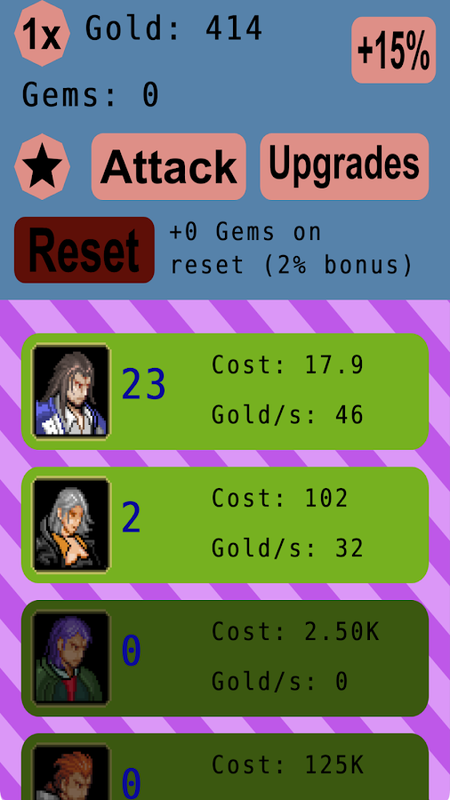 In Idle Hero Attack - Clicker, you mustpowerup your heroes to fight monsters and collect gold. This idle/incremental / clicker game has 8 heroes as well as upgrades youcanbuy for each one. Later in the clicker game you can reset forgemsthat give you a permanent idle gold boost. Gold is alsogeneratedoffline so you don't need to keep the game open while youidle. If you enjoy Idle Hero Attack - Clicker, please leaveareview. Circlen is a one-touch game of skill where the goal is to completeeach of the 40 levels by collecting as many stars as possible.Stars are used to unlock later levels, and there are 3 stars perlevels. Dodge various obstacles to collect the stars and thentravel through the exit portal.Your circle will start each levelspinning in a clockwise direction, and tapping on the screenchanges direction so you can move around. Fast reflexes are needed,especially if you want to collect all the stars in the laterlevels. Do you have the skill to beat all 40 levels and collect all120 stars?If you enjoy this game, please leave a rating or review. Color the blue hexagons red in this new coolsimple puzzle brain game, using the special rotation hexagons tomove them around. Playing is easy and needs only one finger totouch the hexagons on the screen. Control the rotation hexagons bytapping on them. If you make a wrong move, touch the reset buttonto try again. Levels begin locked, but completing one level willunlock the next one. There is no timer in this puzzler, so take aslong as you need to solve each level. The goal of this puzzle game is to move each node until the numberof connections to other nodes matches the number on the node. Tap anode to select it and then tap another grid square to move thenode. Complete each game faster and with less moves to improve yourscore. Each game is randomly generated but will always have atleast one correct solution.If you enjoy this game, please take timeto leave a review. In Idle Monster Slayers, you need to buildupyour units to collect gold that you can use to buy more units.Thisidle / incremental game has 8 unit types, upgrades for each,andachievements at certain intervals. Later in the game you'llstartcollecting soul orbs that give you a permanent gold boost whenyoureset. Gold is also generated offline so you don't need to keepthegame open while you wait. ObjectiveYour goal is to blow up all of the circles on the screen,but you only get a limited number of touches per level. Choose yourmoves carefully to complete all 20 levels.DetailsThe circles witharrows on them will fire projectiles in the direction of thearrows. When the projectiles collide with other circles, thosecircles explode as well, causing a chain reaction. The circle with9 squares in it will explode and affect any other circles directlynext to it including diagonally. The circle with a ring inside itwill target the nearest circle with a laser and make it explode.Ifyou enjoy this game, please take time to leave a review. This game is a simple puzzle platformer where the goal is to drag abox around with your finger to help Bob escape each level. Both Boband the box must reach the exit in each level because you only haveone box. Watch out for dangerous sawblades in later levels thatwill hurt Bob and break the box.Controls for this game are simple,just one finger needed to move the box or tap any of the UI buttonson the screen.The game has 12 levels as it was originally made forLudum Dare 28, a 2-3 day game competition.If you enjoy You Have OneBox, please take time to rate/review. The evil Kanthor lives on top of the tower. Fight your way throughslimes, bats, skeletons, and mages to destroy him!Use the on screenbuttons to move and attack.If you like this platformer rpg game,please leave a review. Control a robot to complete the puzzles and escape all 20 levels.Touch the arrow buttons on the lower part of the screen to move. Anoptional speed toggle button can be touched for slower but moreaccurate movement.You can run into green blocks to push them, andlater in the game you can also push enemies under certainconditions. There are three powerups you can collect: fire, ice,and air. The fire powerup melts any frozen enemies and destroys anyunfrozen enemies. The ice powerup freezes enemies so they are safeto push around. The air powerup allows you to push both blocks andenemies from a distance. Medieval Idle RPG is an incremental, role-playing game with anASCII art style. 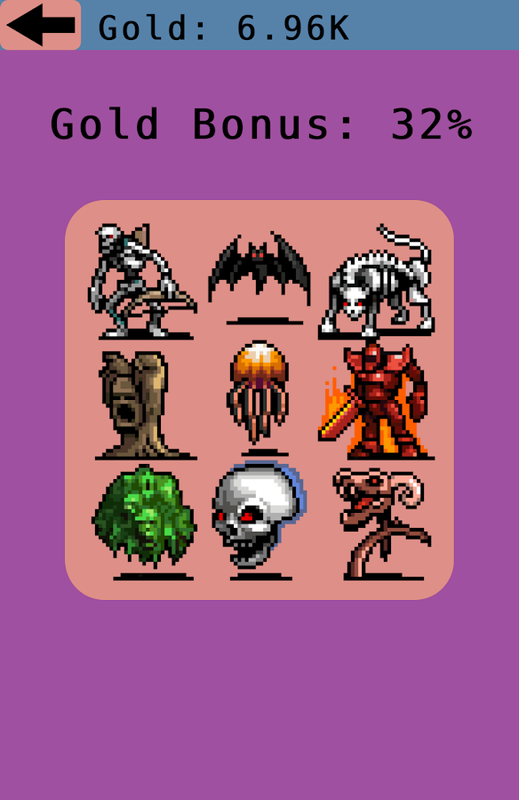 Start with nothing and incrementally gain goldcoins, weapons, potions, and other items to use on your quests!This game features a unique ASCII art style similar to games likeCandy Box and A Dark Room. Your quest awaits you, what are youwaiting for? Top 10 Tapper of 2016. Over 1 Million downloads across allplatforms so far! Idle Armies is a tapper like no other, sure youclick, upgrade, tap, prestige and all the rest, but you do itcontrolling two immense armies. Start as the good guys, unlocksarcastic Sabrina, the enthusiastic knight Lil Dan and a host ofother RPG characters. Complete quests, unlock perks and spells,battle an unending swarm of skeletons, orcs, goblins and bosses(clicking all the while) and then… SWAP. Play as the bad guys. Putup with love-struck goblins, an anxious cave troll and anover-zealous mummy in your evil army as you tap away. Unlock pitswhere human prisoners toil to boost your idle economy. Discovercurses, visit swamps and wastelands. Fight endless waves offarmers, peasants and bosses and then… BATTLE your two armiestogether to prestige. That’s right watch as your chatty friendsmassacre each other, but to become an idle tycoon you knew therewould be sacrifices. Prestige to become stronger and stronger,gaining damage boosts, economy boosts and a whole load of usefulitems and perks. 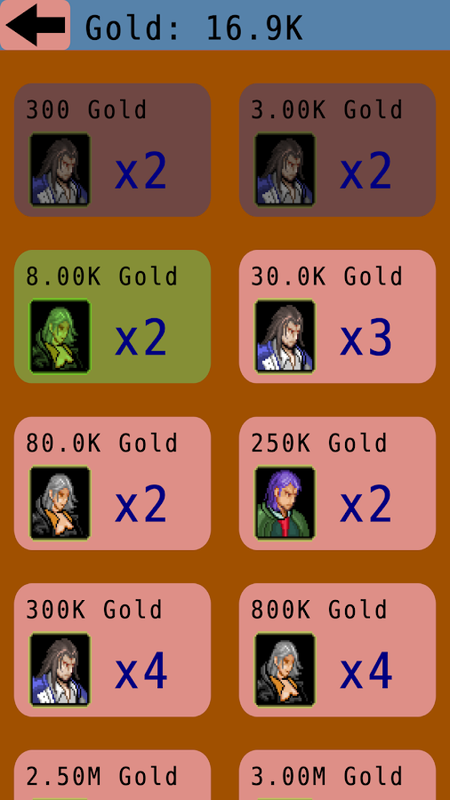 Idle Armies is an RPG clicker with a difference,it’s funny, it has a lot of depth and it’ll keep you clicking forhours! It was highlighted as a top 10 tapper of 2016 by the AppleAppstore. Features: +Hilarious banter between your army as youplay. Covering everything from the economy, clowns, RPG tropes andother clicker tycoons. +Control two immense armies – each withdistinct heroes (or villains), technologies, spells and upgrades.+26 RPG characters to unlock, upgrade and rank up. +Travel todistant locations to unlock buildings and upgrades that boost youreconomy. +Loads of extra features – Prestige to unlock bonuses andspecial items, weekly events, economy perks and more. +Become anidle tycoon – earn millions, billions, quintillions... evenoctodecillions without clicking… although clicking certainly helps.If you've read this far well done, when you find a hermit be sureto use the code: WA4EVER! Game Features:24/7 BattleEven when you log out, your character will keep fighting themonsters and earn experience and gears for you. A marvelousfunction that makes your dream come true! You won’t miss any battleand can boost your EXP and loot gears even when you are sleeping.Job Change SystemYou may choose among traditional classes, either male or female,from strong and fearsome fighter, nimble and accurate hunter, orgorgeous mage who uses magnificent spells to blast the enemies, andcombine your own skill set. By leveling up your Base level, you canadvance your Job to higher classes. Use your wisdom to crush yourenemies.Unique SmeltingYou can smelt your common or unwanted gears for better items orsmelting points. What are you waiting for? Awesome gears await!Hot ArenaYou may show off your strength by defeating other players in theArena. Defeat higher-ranked players to switch place with them andearn periodically distributed diamonds. Fight your way up todominate the leader-board! Knighthood awaits, in this idle-clicking adventure. King Cedric theGreat steps down from his throne after centuries of battles and nowseeks an heir! Prove yourself to be an able knight and successor bygaining wealth, conquering lands and villages, and annihilatinggoblins, trolls, orcs, and more. Embark on this magicaljourney!EPIC HERO WITH KNIGHTLY SKILLSMilitary tactics and swordskills will help defeat warlocks and evil creatures of all sorts.Use weapons crafted from blacksmiths and potent ingredients fromalchemists to fend off dark necromancers and clash with dragons!Hunt or be hunted!YE OLDE MARKETPLACEBecome the wealthiest man ofthe Middle Ages. Purchase various goods and trade them offthroughout the kingdom. The wealthier you become, the stronger yourreputation. Join guilds and put your trading skills to the test orsimply hire merchants to earn money and power on your behalf! Watchas your kingdom grows into a thriving community with castles, shopsand more! CORE FEATURES:• Middle Ages RPG clicking adventure!•Upgrade your hero to create a knight of epic proportions! • Fight 6bosses with unworldly strengths and achieve greatness!• Joindifferent guilds!• Recruit squires and merchants in your service!•Explore alluring worlds!NOBLE UPDATED FEATURES• Awesome HeroSpirits upgrades!• Lots of cool, new Medieval equipment in theshop!• New Prestige System!• New starter packs!• Offline profitsare doubled!• More incentives for returning knights!Your path toknighthood won’t be easy. Infinite challenging quests and epicworlds are waiting to be conquered. Join Hero Simulator, downloadthe APK right now! The very existence of the Kingdom depends onyou!